CoolSculpting is a safe, non-invasive procedure to reduce fat in common trouble areas that tend to be diet and exercise resistant. It’s called stubborn fat for a reason: no matter how much you eat healthy and exercise, it’s virtually impossible to lose those annoying muffin tops, love handles, and belly. Only CoolSculpting targets fat cells alone, eliminating them in an easy, non-intrusive fashion that exercise and diet can’t achieve as quickly or as effectively. Developed by Harvard scientists, the precisely controlled, FDA-cleared, patented procedure uses a cooling technology that targets subcutaneous fat cells by freezing them to the point of crystallization. Once crystallized, the cells are then eliminated from the body through the lymphatic system in a natural process. There is no damage to healthy tissue or skin cells. Because the procedure is non-invasive, there is no need for needles or anesthesia. Patients typically read, work on their laptops, listen to music, or relax during the procedure. Each session is less than an hour and therefore can easily be fit into a lunch break. After treatment, patients typically find it easy to return to everyday activities with minimal discomfort. Procedures that use laser or sonic waves to remove fat can actually destroy other tissue in the process by burning, shattering or extracting non-fat cells. This requires downtime for your body to heal. 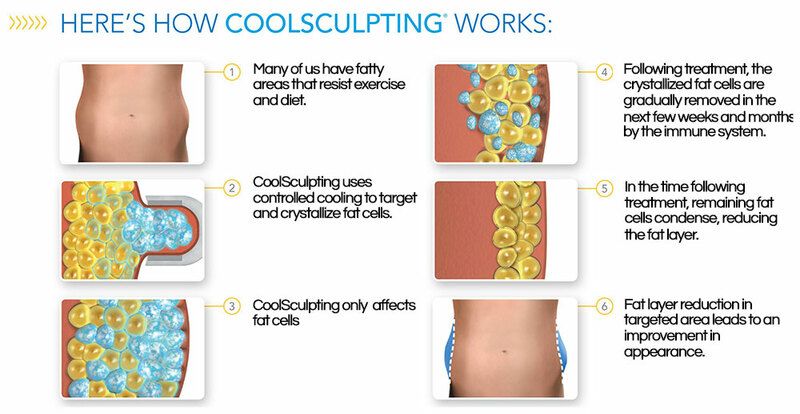 CoolSculpting uses a targeted cooling process that kills the fat cells underneath the skin, literally freezing them to the point of elimination. Only fat cells are frozen. Your healthy skin cells remain, well, healthy. No knives. No suction hoses. No needles. No scars. Once crystallized, the fat cells die and are naturally eliminated from your body. In a few months: say hello to a new you. 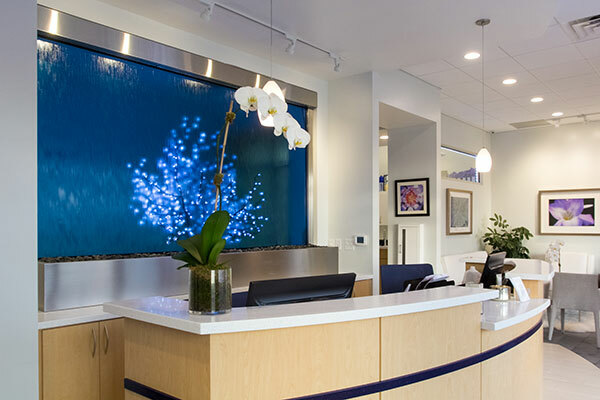 After your CoolSculpting treatment you can get right back to your busy day. Each treatment lasts 35 minutes – the same time you might spend at the gym. So you can easily fit your appointment into a lunch break. After one visit, you’ll typically see a noticeable reduction of fat. It takes a few months to fully realize the effects, mainly because it takes that long for your body to naturally dispose of the fat cells. And yes, you can lose even more with additional appointments if you and your CoolSculpting provider deem it necessary. Because the fat cells that are eliminated from CoolSculpting do not return, the results are lasting as long as a healthy lifestyle is maintained. After a few months, your clothes will fit better and you will look better. What’s more, there are no pills or supplements. And as long as you maintain your normal diet and exercise, your long-term results should remain stable.